For other uses of "decapod", see Decapod (disambiguation). The Decapoda or decapods (literally "ten-footed") are an order of crustaceans within the class Malacostraca, including many familiar groups, such as crayfish, crabs, lobsters, prawns, and shrimp. Most decapods are scavengers. The order is estimated to contain nearly 15,000 species in around 2,700 genera, with around 3,300 fossil species. Nearly half of these species are crabs, with the shrimp (about 3000 species) and Anomura including hermit crabs, porcelain crabs, squat lobsters (about 2500 species) making up the bulk of the remainder. The earliest fossil decapod is the Devonian Palaeopalaemon. 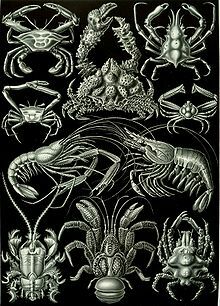 Decapods can have as many as 38 appendages, arranged in one pair per body segment. As the name Decapoda (from the Greek δέκα, deca-, "ten", and πούς / ποδός, -pod, "foot") implies, ten of these appendages are considered legs. They are the pereiopods, found on the last five thoracic segments. 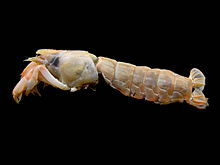 In many decapods, one pair of these "legs" has enlarged pincers, called chelae, with the legs being called chelipeds. In front of the pereiopods are three pairs of maxillipeds which function as feeding appendages. The head has five pairs of appendages, including mouthparts, antennae, and antennules. There are five more pairs of appendages on the abdomen. They are called pleopods. There is one final pair called uropods, which, with the telson, form the tail fan. Classification within the order Decapoda depends on the structure of the gills and legs, and the way in which the larvae develop, giving rise to two suborders: Dendrobranchiata and Pleocyemata. The Dendrobranchiata consist of prawns, including many species colloquially referred to as "shrimp", such as the "white shrimp", Litopenaeus setiferus. The Pleocyemata include the remaining groups, including "true shrimp". Those groups which usually walk rather than swim (Pleocyemata, excluding Stenopodidea and Caridea) form a clade called Reptantia. This classification to the level of superfamilies follows De Grave et al. ^ Robert P. D. Crean (November 14, 2004). "Order Decapoda: Fossil record and evolution". University of Bristol. Retrieved January 2, 2010. ^ a b c "Decapoda characters and anatomy". University of Bristol: Decapoda characters. Retrieved 11 December 2017. ^ Elena Mente (2008). Reproductive Biology of Crustaceans: Case Studies of Decapod Crustaceans. Science Publishers. p. 16. ISBN 978-1-57808-529-3. ^ G. Scholtz; S. Richter (1995). "Phylogenetic systematics of the reptantian Decapoda (Crustacea, Malacostraca)". Zoological Journal of the Linnean Society. 113 (3): 289–328. doi:10.1006/zjls.1995.0011. Wikimedia Commons has media related to Decapoda.